Samsung’s Galaxy Note 7 was today banned from all airplanes and flights in the United States by the Department of Transportation, the Federal Aviation Administration, and the Pipeline and Hazardous Materials Safety Administration. It is now labeled as a “forbidden hazardous material” under the Federal Hazardous Material Regulations. Individuals who own or possess a Samsung Galaxy Note7 device may not transport the device on their person, in carry-on baggage, or in checked baggage on flights to, from, or within the United States. This prohibition includes all Samsung Galaxy Note7 devices. The Department of Transportation has issued an emergency order that will prevent the devices from being taken on a flight even when powered down as of Saturday, October 15 at 12:00 p.m. Eastern Time. Galaxy Note 7 smartphones are no longer allowed in checked or carry-on luggage and cannot be shipped as air cargo. Customers who attempt to bring a Galaxy Note 7 on a flight could have their devices confiscated and could face fines. Those who attempt to evade the ban by putting their smartphone in their checked luggage could be subject to criminal prosecution in addition to fines. The official flight ban comes just days after Samsung permanently discontinued production of the Galaxy Note 7 and asked its carrier partners around the world to cease selling the device following reports that “safe” replacement Galaxy Note 7 devices were also catching on fire. Samsung has not yet discovered the defect affecting the new devices and has not been able to reproduce the issue in house, but it has been forced to scrap the Galaxy Note 7 due to consumer outcry and regulatory investigations. 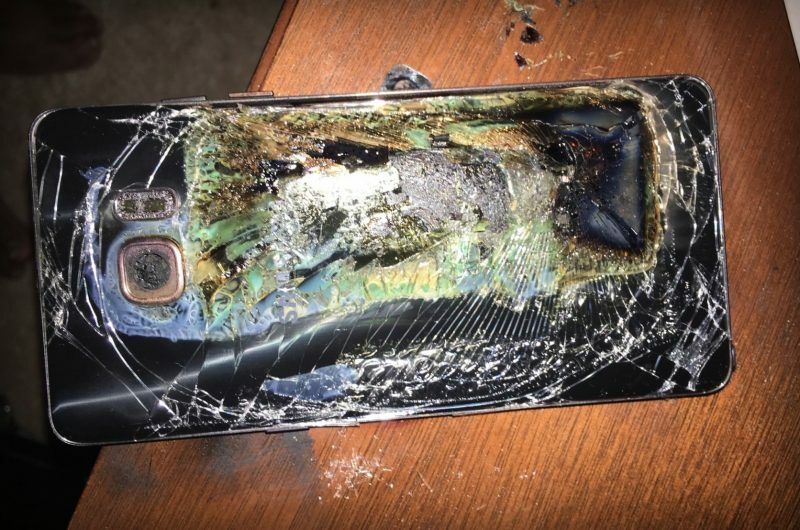 Samsung has asked Galaxy Note 7 owners, both with original and replacement devices, to power them down immediately and return them for a full refund. All four of the major carriers in the United States are allowing customers to return their Galaxy Note 7 smartphones for other smartphones, such as the iPhone 7. Ending production and sales of the Galaxy Note 7 is expected to cost Samsung upwards of $2.3 billion, on top of negative public perception.